Our sink is most often a complete mess. Between the regular sponge, the bottle washer, magic soap, regular soap, lotion and dish soap, it is a wonder you can see my countertop over there! I wanted a way to group most of those items together without them just ending up in a pile on the counter. I was clicking around Pinterest and saw someone using a cake plate for this purpose and the light bulb came on! Genius idea right? So, I got to work hunting down supplies to make this happen. Candlestick – check! Plate – check! Glue – check! My plate was white so I picked up some colorful spray paint from Home Depot and gave it a good spray. I also used some copper acrylic paint I had hanging around the house to make a very rough looking (on purpose!) border around the edges. Of course, after all that work, I saw an almost identical plate in Target the next day. I picked it up in case something happens to my “precious” plate. Then, I placed my plate on top. I flipped it upside down and set a pot on it for awhile just to make sure the two pieces adhered well. Once it was dry, I loaded it up with my kitchen supplies next to the sink. Pretty simple project but it makes my sink seem so much more organized. 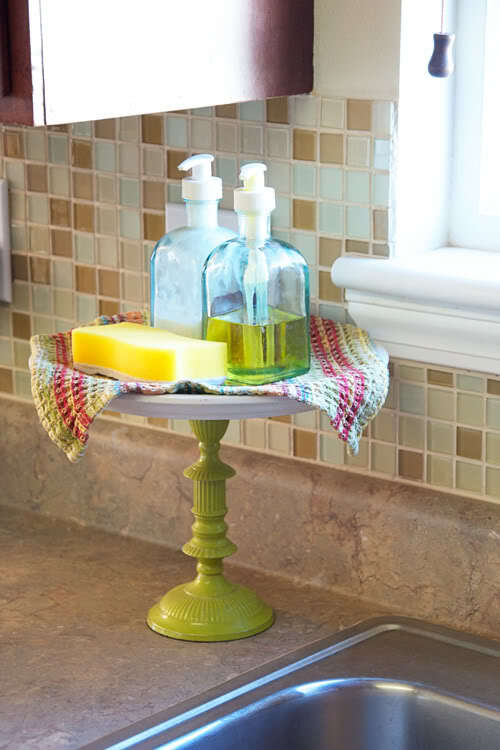 Have you repurposed anything like a cake plate recently? How adorable! My husband bought me a sink caddy type thing that spins several years ago after he heard me complain about the mess on the counter. I still use it but it’s not nearly as cute as yours! I love this idea! Did something similar for countertop necessities such as oil and sugar, etc. I’m always complaining about my soap and sponge clutter. I will add this to my projects. Oh no! One more! What a great idea! A real space saver! Thanks so much for linking up! That is such the cutest idea ever!!! I am totally “pinning” this and will be making sometime soon! Thanks for the idea and linking up at Thursday’s Temptation! That is a great alternative use for a cake stand. I bet it would work just as well for bathroom without much counter space. Great way to organize and keep the clutter down! Thanks so much for sharing at the Kiss & Tell party over at I Gotta Create! I found some cuhttp://pam-lifethroughmyeyes.blogspot.com/te shorter candle holders and plates at Goodwill and made a couple of these for Christmas….I love the idea. This one is really neat. Love this idea- thanks for sharing. I cannot wait to make one! I love the idea! I have that same image pinned on pinterest. I am in love with this. I actually have the picture pinned as well. I love your stand and how you made it. I am having a Feature Friday Linky Party and would love for you to link up! What a fun idea for a cake stand. Those cake stands can be used for just about anything, can’t they? that’s one of my fave shades of blue! thanks for linking this up last week! cute idea for all that stuff. i haven’t ever thought of that! I just wanted to let you know this is being featured on my blog today!! This turned out really cute! I’ve been meaning to make one like this as well. This is really cute! I’m your newest follower! Love your blog! Excellent Idea! I’m looking for ideas for serving trays for a Sweet 16 Birthday Party. This is perfect. I could do all different sizes and heights.